Let's get back to what's good! The Force Awakens ended on a pretty apt visual metaphor: someone preparing to literally pass a baton, as JJ Abrams stepped aside to let other directors continue the Star Wars story. And to his credit, Rian Johnson picked up right at that same spot - before going off in a decidedly less... "greatest hits" direction. Smart choice, since the result was the best Star Wars movie there's been yet, but that's beside the point. 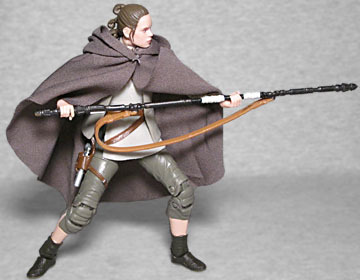 What we're getting at is that today's figure could easily fit into either your Episode 7 or Episode 8 collection. 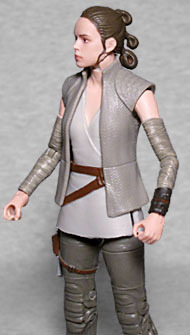 You'll recall that the first Rey figure had some problems with its likeness. It was so bad that they had to do a running change in later waves to make her look at all like she was supposed to. These days we have the "Photo Real" process, which delivers paint apps that are commensurate with the quality of the sculpt, so this new Rey looks outstanding. She absolutely puts the previous ones to shame. 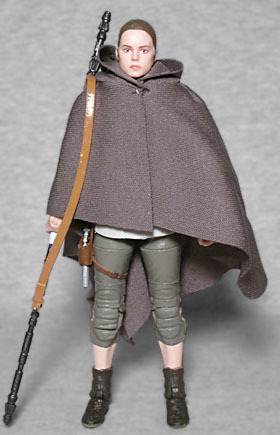 Ahch-To is also much rainier than the desert planet Jakku, so Rey includes a removable rain poncho. It's made from actual cloth, meaning it doesn't block her articulation when she's wearing it; like all the Black Series figures, she moves at the head, neck, shoulders, elbows, wrists, waist (concealed perfectly by the belt she wears), hips, thighs, knees, and ankles. The right wrist hinges in such a way that she can point whatever accessory she's holding forward, while the left goes the other direction. Wondering what accessories she has? Well, sadly it's not a new version of BB-8 - there isn't one of those for this movie. 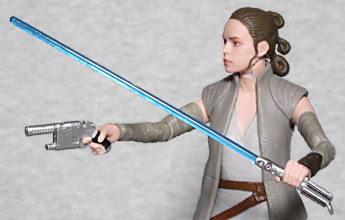 She has a new version of her fighting staff (you can tell it's new because the strap is hanging the opposite direction than it did last time), the NN-14 blaster pistol she got from Han, and the lightsaber she got from Maz with a removable blade. The gun can fit in the holster, no problem. The Last Jedi provided more opportunity for Rey's character to evolve, and for Hasbro to show off how much their toymaking skills have done the same.